As the wedding day approaches, I believe most brides start to over-analyze their looks (I know I did at one point). I was looking through thousands of pictures on Pinterest for hairstyles and makeup looks and dresses, trying to decide what would make me look best. I felt a lot of pressure to look picture-perfect, because obviously there are so many pictures taken of you on that day. Eventually I decided to let go of this stress to look perfect, since there are a lot of things you can't control or change about your appearance. I definitely realized (especially after the wedding), that people are there to celebrate YOU, for who you are - together with your future husband. However, I did take a few steps before my wedding day to get my hair to look - not perfect - but the best it could look. I started this "regime" a few months before the wedding, so that I would get the best results. One of the main problems I had was hair loss. I don't usually have a problem with this, but I guess that's one of the joys of wedding stress. I do feel like I was not a bridezilla (which was confirmed by friends & family - haha!) and that I was not as stressed as other brides I saw. However, it did affect me - a lot more than I thought. And as your wedding day gets closer and closer, the last thing you need on your plate is stressing over the fact that stress makes your hair fall (it's a never-ending cycle). So I was recommended by my hair stylist to try a L'Oreal serum for hair loss. I picked the Aminexil Advanced and I was really surprised that it actually worked. I was very skeptical about it, but it really helped my hair a lot. The other two products that I used a lot are my beloved shampoo & conditioner by Alterna, from the Caviar range. These are absolutely amazing and they're free of sulfates and all those ingredients you're usually trying to avoid in beauty products. My hair feels amazing after I use them and it looks super shiny. And, yes, they are expensive, but I do find that they last me a lot longer than regular shampoo & conditioner, mainly because you don't really need a lot of it when you wash your hair. Finally, I wanted to use a deep conditioning, hydrating mask, so that my hair would look really shiny and healthy. 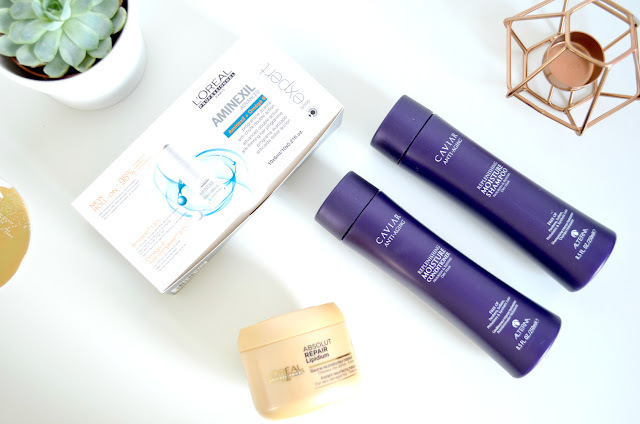 I picked the L'Oreal Absolute Repair Lipidium Masque, which is a great product that I will definitely repurchase after I finish it (although it will probably last me a long time, because you only need to use a small amount at a time). My hair has never felt so soft! It has a very lovely scent and it definitely moisturizes your hair really well. I honestly could ramble on about these products forever, but I'll leave it at that. I would highly recommend trying these products if you haven't already. They're obviously not only for when you're a bride, but I just started using them before my wedding day with that purpose in mind. I hope you enjoyed this post! Let me know what your haircare staples are at the moment! Great tips; totally agree with you on all of these! I have maroon boots like the ones in your picture and I wear them all the time.